Back to basics, what is it? 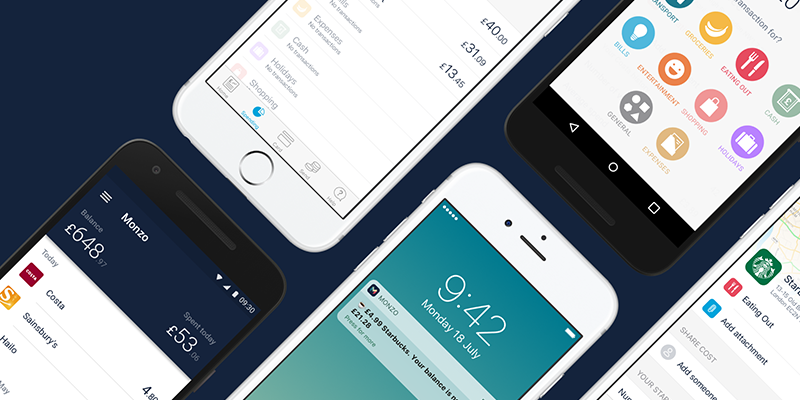 Monzo is a mobile app based bank, one of the first solely digital UK banks. Founded in 2015 (then Mondo) in London by Tom Blomfield, Jonas Huckestein, Jason Bates, Paul Rippon and Gary Dolman. A way of requesting money from anyone via a webpage. Up to £300 a month of free international cash withdrawals. (optional) In-app beta testing of new features. From the offset, Monzo has made signing up as seamless as possible. After creating an account you can validate your name and address by scanning ID and documents within the app. It's fundamentally great UX design. To prove you're real (and really you) they request you film a short video and say a specific phrase. The video was the most uncomfortable part, but it beats carting legal documents to a (not so) local branch, to queue. Using Monzo every day is a breeze. I noticed immediately (and love) that it doesn't force me to authenticate every time I open the app. It shaves seconds from the loading time and makes it feel really snappy. You can turn a pin / FaceID / TouchID on in settings if you want to be super secure. Again +1 for excellent UX design. The home screen is composed of a balance summary, your daily spend, spending graph, transactions list and a five-item navigation bar. There are some really great UX design touches throughout the home page. For example, knowing your eye will be drawn to the darkest item onscreen the account balance background is filled in. Below the graph things become a little denser but equally considered. The transaction list is easily searchable by name, date, amount or tag and every transaction has a space for a company logo or photo. There's a good sense of information hierarchy here. The icon/image creates a visual weight to the left counterbalanced by the larger transaction amount on the right. This text is second largest in-app and it's also colour coded black for an expense and green for a credit. The list is glass like to scroll through, there's a great motion design link between the vertical scroll and the horizontal timeline. This flawless UX design means that by engaging with one aspect of the app you instinctively know how to use another. What becomes clear is the native build, comparing scrolling this to many other banks is night and day. Not once does Monzo have you waiting for a pagination load. These details matter when you could be app switching from your bank to instagram. Tapping on any transaction gives you more information about it with a delightful level of detail. There's a map showing the location, the amount, a tag, a space for notes, an option to add a receipt, transaction averages, number of visits, total spent and a "Something wrong? Tell us!" link. These are all smaller UX design improvements that add up to make a big difference. Take for example a scenario of a transaction you don't recognise, traditional banks give you simply a name and amount. Monzo can show it on a map, which often results in an "oh yeah I was there" moment. typing the problem in chat and doing something else until you're notified of a reply. …is huge, I honestly can't believe banks haven't used this model for years. The primary navigation of the app is an iOS tab bar. It works extremely well and they have kept labels below their icons (always a good idea with UX design). 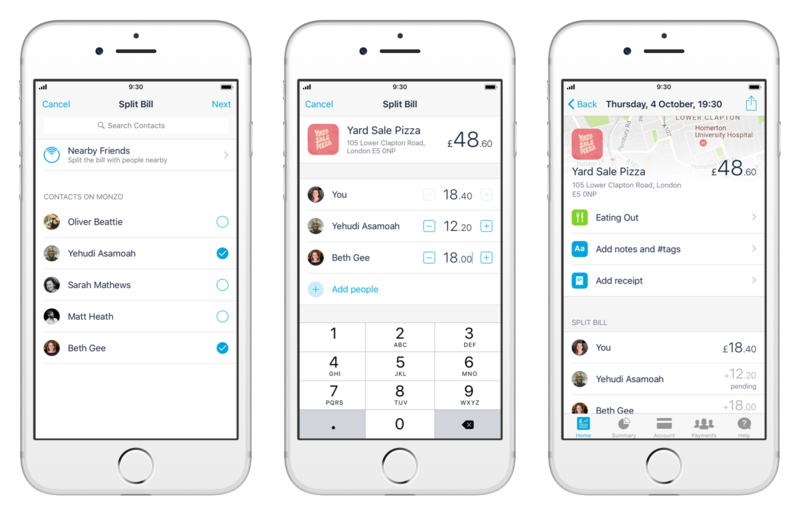 The five areas of the app are Home, Summary, Account, Payments, Help. The summary page is the place for budgets. Monzo seems to be using an algorithm to predict a budget (it tells me I won't have enough this month). I believe it takes the account balance and combines with expenses already made to predict an average for the month. I keep a very tight reign on my finances and this predictive model never works for me. It's something that could be improved or explained better as the ambiguity around how its predicting creates stress. I did contact the help team in an attempt to work out what was going on to no avail. It is a feature that gets good reviews from others who use the service though. So I'm likely to be an edge case. The app also lets you set a manual budget and auto themes your transactions with great accuracy. The ingress for budgets was a strange choice (top left and shown below as a "Targets" link) and it seems odd to use a space typically associated with a back action on iOS for an entry point. That being said, I presume it's a set up once and forget feature. I have found myself looking back at my spending a lot more since I set up my budget. Which makes it great. Another UX design touch that stood out was that when running close to a limit the app sends a notification. This makes you think twice about that overpriced lunch, in turn preventing overspending on impulse purchases. Another thing that made a huge difference for me when banking was the instant transaction notifications. Whenever you're account is charged or credited, you get notified (often with emojis). This really is delightful, it gives you an added sense of security as you'll always know if someones defrauding you. Also it makes you much more cognisant of your spending. Dissuading impulse purchases through clever UX design additions like including a message of "That's £10 you've spent today". The real time balance updates are another small but amazing UX improvement. With one of my banks it still takes three days to confirm a transaction has taken place! This is another area that really stands out, payments have their own tab in the nav and the page has a clear and structured layout with clear differentiation between paying people, others on Monzo and bank accounts. A nice UX design touch to payments is the native integration with iOS contacts which pushes other contacts with Monzo accounts to the top of your list, followed by recent payees. The ability to search is also great. This is another place where those icons and photographs of peoples profiles really stand out and it makes sending money very much frustration free. Transfers happen instantaneously and international transfers through transferwise are possible (however I haven't tried them in the app yet). Overall this page is good, if a little cluttered, also the search bar up at the top isn't the easiest to reach. It feels like the page needs a little cleaning up at the moment (especially with the addition of the Christmas gift). One thing I did find a little strange about making payments is the default verification process. You still have to type your cards pin code every time. I found it odd that as a mobile app they haven't used biometrics. Presumably, it's to do with establishing a clear intent, you can turn FaceID on in settings though (happy days). The UX of a help section. Help is a real standout feature of Monzo and you can tell they're putting a lot of energy into it. The main page itself is a search field, but it also has some suggested items below (again personalised to you). You start finding help by using the search bar, and if you can't find what you're looking for you can "chat to a human" 24/7 365. That chat feature is the standout feature that makes Monzo the best bank available. It's been widely confirmed that millennials do not like phone calls, yet for some reason, non-startup banks insists upon putting you on hold and making you listen to Wagner. This is the perfect balance of human and tech. The staff are always helpful and friendly in a way that I have never experienced with any other customer service. When you need help Monzo clearly has your back and its honestly beyond delightful. the ability to freeze your card (I did this yesterday as a cash machine ate my card) (a feature already being adopted by Barclays and TSB). The ability to order a new card after freezing one (again this was seamless). Pin - great when you first get the card and need to remember the pin. It authenticates and then shows you your pin. (No more lengthy questions about your grandmothers maiden first pets surname, I totally see others stealing this feature soon). Monzo has joined the trend of involving its community of members in its development, this (much like Giffgaff, Freetrade and to some extent the co-operative) uses a dedicated website. Where you can create comments, share news, review other services, request features etc. I feel the design of online communities is lacking and they often feel like Reddit had a baby with facebook. Monzo hasn't done anything revolutionary with the Community and it will be interesting to see how it develops. It's not bad by any means, and it definitely has a lot of users who are very much engaged. However for me its just not something that really appeals. If you do join the bank it's worth a perusal and has already informed some of their designs and features. Linked with their community model Monzo keeps a blog page (formerly a Trello board) so you can check the status of features and when they expect to release them. This was particularly nice as they worked through a list of common customer requests this year and is a good place to look if you find a feature is missing. 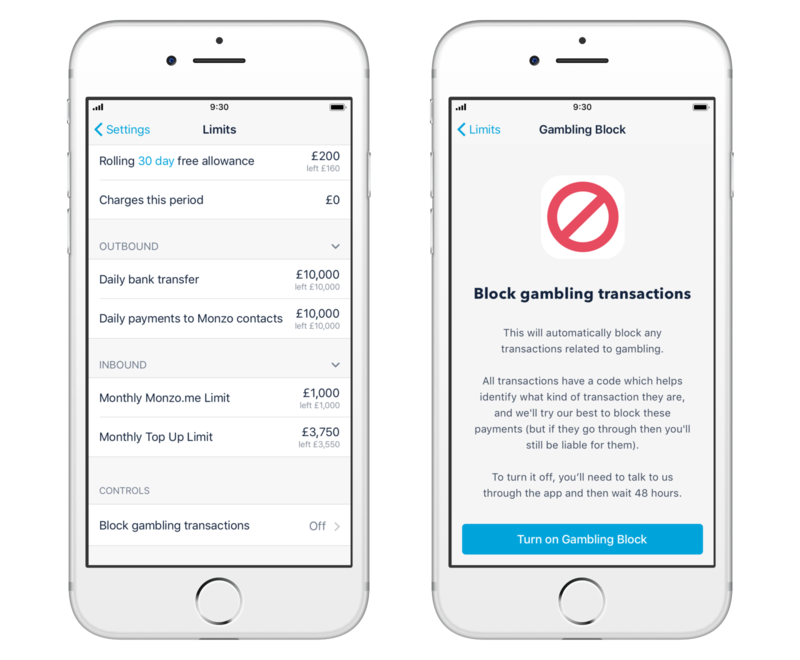 Really cool to read about, Monzo have taken a clear stance on helping people, so for those who want to self exclude from gambling or (for example) Bi-Polar disorder you can notify them in advance and block certain transactions. It's a really nice touch! A new feature that lets you split a transaction with friends instantly, it's actually really cool and works extremely well and now supports transactions not done on Monzo (goodbye splitwise). go to your account, 2. tap on yourself, 3. open your profile scroll to the bottom and 4. tap "Monzo labs"... no not exactly optimal UX design. One huge previous criticism of Monzo was what happened when a customers card and phone were lost or stolen. Monzo has since created a "Monzo for emergencies" website, where a customer can use their email to access their account and lock it down. It seems like the best the UX design could be, but access to the internet and email still feel like potential road bumps to the CX (sometimes a phone number might be helpful, even for millennials). While Monzo is great in many ways it still has some limitations and challenges ahead. The main issue I have faced is I believe a pretty rare one, in order to have my expenses paid into an account I need an IBAN and right now Monzo doesn't provide one. Not providing IBANs and using transferwise for international transfers also means I can't make certain payments that I need, the feature has been on the roadmap for a long time so I'm hoping it launches soon, it does seem a pretty niche problem though. Again as mentioned before the budget page doesn't seem to work for me, this I think is in part because of the way I manage my finances so transactions take place early in the month, and also because I use my credit card for most purchases. I assume I'm not alone with this! I have my reservations about the community pages and their usefulness, however, they do have a lot of engagement and features are being driven from there which means there's definitely space for improvement and optimisation. The web client remains limited to just an emergency tool, I don't know that I see this as a problem right now, but it may become one in future. Customer contact methods, this really is a double-edged sword, with no branches and no phone support it is really easy to use chat for most day to day help, I do think there's some missed opportunity around physical space though. Paying in cheques currently has to be done by posting the cheque to Monzo HQ, this works as a basic method, but other banks allow cheque scanning in-app and this feels like a clear gap. Notifications can at the moment get a little incessant, and I would like to see a little more logic about them, for example, if I pay using apple pay, do I really need an iOS wallet notification and a Monzo one? (I know I could turn the wallet ones off but it's not the only card I use). Given the number of notifications I get in a day (92 according to iOS screentime) I'd like to see a little more logic or control of how and when Monzo tells me things. I.e. an option for "only notify me of suspicious transactions". 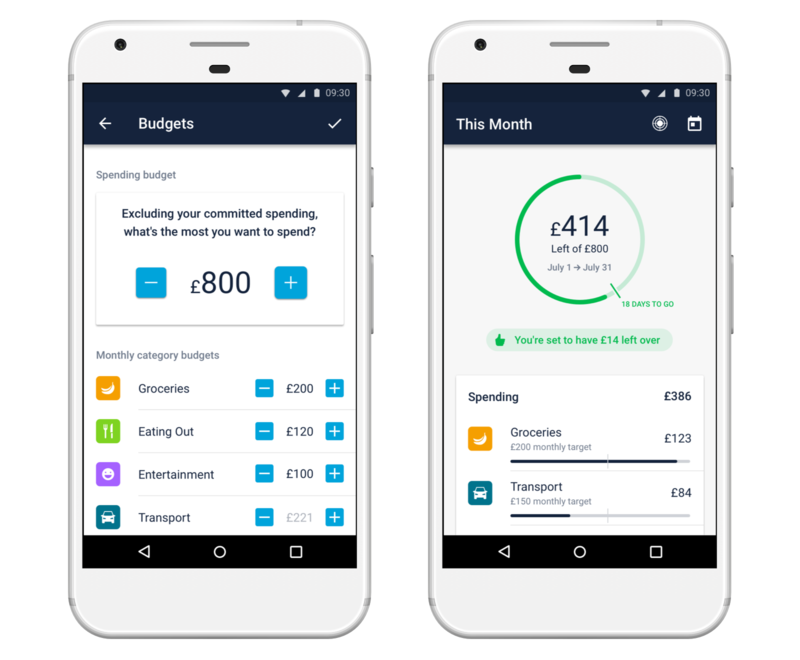 Two things that are less a limitation and more risks are feature creep and market cannibalisation, as Monzo adds more and more features to the app it's going to become harder and harder to make the flows run cleanly together (think of that budget button hanging out in the top left). I believe they plan to start recommending services, helping you switch providers really easily in-app, and effectively offer a marketplace. I'm sure they also have many other things planned, as they add features app real estate becomes much more costly! With market cannibalisation other banks are already stealing features that make Monzo different, as they do that the value proposition of the bank needs to be extremely clear and focused, after all, what really matters is "why should I use Monzo over x?" Bringing the community more into the app would be an interesting design challenge, the ability to enable "Labs" already is one such way (albeit very nested and hard to find) but Monzo could rethink the way the community and app work together to create a unique UX design that's both in one (something that Giffgaff have tried with their app and failed). The Monzo app has some great UX design that allows you to feel much more in control of spending. It has a clear focus an intent, a good hierarchy of information, clear labelling and is extremely performant. It has a few areas that could be improved, explaining how budgets work, making the experiments more accessible, integrating the community more, adding IBAN and making face ID/biometrics the default for sending payments (or at least prompting the first time with a choice. Plus paying in cheques via the camera of the phone seems like a no-brainer. I'm also really intrigued to see how the UX design of their marketplace model shapes up. As they are using open banking standards it would be cool to see integration with credit cards (automatic integration with budgets) and service suggestion switching (e.g. gas and electric). I'd also like to see more work around "hidden" subscriptions and refinement or control of notifications. I now use Monzo as my day to day account and I'm looking forward to seeing its full potential realised. I clearly ❤️ it otherwise I wouldn't have invested. Finally, here's the gift I promised, if you sign up to create a Monzo account using this link you get £5. So at least you got something from reading through all of this ;). Any questions, comments or anything else either leave them on this post by clicking the title and scrolling to the bottom or tweet me @stivenskyrah. This blog is a combination of things I write and a curation of internet articles. If you like what you read, please check out my "Friends Discounts and Bonuses" page for some great offers that benefit us both.